WFAE has been on the search for the next great podcast through the Queen City PodQuest. We know the Charlotte region has so many stories to tell so we turned to you for ideas, and the response was huge. More than 370 people submitted pitches for podcasts they want to produce. Now, it’s up to the community – that means you – to vote for the podcast you want to hear the most. Podcast Manager Joni Deutsch joined WFAE’s Lisa Worf to discuss the competition and the voting round. Lisa Worf: So, you waded through submissions for a solid week. I'm glad to see you coming up for air. Joni Deutsch: I’ve got to let my ears breathe just for a little bit because again, listening to more than 370 submissions — that's a lot of audio. That's a lot of stories. But I'm telling you it was a wonderful experience, one that I'm sure others are experiencing now as they listen through these entries to determine which they should vote for. Worf: How are all the podcasts looking? Deutsch: Well, they look great they sound great. You know, we really wanted this to be a way for anyone in the community — no matter their age, no matter their audio experience, no matter their background — to be able to share their ideas and their stories in this unified platform that we call podcasting. And the response was so interesting. We had individuals who were submitting podcasts about doulas in pregnancy, about dogs, about the craft brewery scene, about adoption [and] about life stories that are just so deep and heartfelt. All that to say, it's been a wonderful experience. Worf: Are there any trends you're seeing as far as topics in genres or are they just all over the place? Deutsch: I think I have heard just about every genre of podcasting from true crime to audio dramas, like Orson Welles’ “War of the Worlds” — that kind of stuff. We've had those kinds of audio narrative stories, you know, and roundtable discussions. 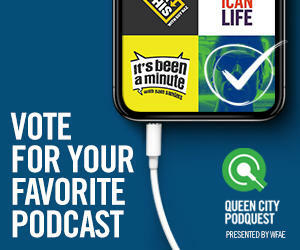 Again, name a topic or a kind of format for a podcast and is likely represented in this Queen City PodQuest. Worf: What have you learned about Charlotte through these entries? Deutsch: That there are a lot of stories that have yet to be told in Charlotte. There are stories about neighborhoods that people are just so curious about they want to dive into those histories. There are topics about drug abuse and addiction, the criminal justice system — things that aren't typically given as much coverage too in a personal way. People want to give those stories to a new audience a new community. I mean really it's just that the diversity of thought and passion put into these different entries show there are so many parts of Charlotte that have yet to be heard from. And I'm so happy that people have that opportunity. The listeners who are voting and the people who are participating this them themselves. Worf: How do you vote? Deutsch: They can find out about the voting process on WFAE.org/QueenCityPodQuest. Right there on the front of that website we have the alphabetized list of entries for this competition that you can click through to read and listen to. You can vote once per day for any of the entries that you want to see become a full life podcast. And I should mention, Lisa, that once this public voting round is complete, we will have five finalists that will then receive one-on-one mentorship for their podcasts as well as the opportunity to potentially when a cash prize and a podcast deal at WFAE. Worf: So many people call on a big network of people for votes. But what happens to those great ideas that may not have that kind of community lift? Deutsch: You know, part of this Queen City PodQuest yes, is to find the next big podcast idea from the Charlotte area. But it's also to empower the individuals and the community members to share their stories through podcasting, which is why WFAE will be providing resources and information about podcasts throughout this Queen City PodQuest, as well as after the contest concludes. It's really our mission to make sure that you have the information and you have the resources, so you are empowered to be able to tell these stories on your own terms, in your own time. Because of the popular demand for this contest of voting has been extended to 11:59 p.m. on Wednesday, February 20. Find more information on WFAE.org/QueenCityPodQuest.